Our image of the week is made of 2000 line segments! You can see more of Hamid's images on this website and on the American Mathematical Society website. No collection of popular maths books would be complete without a work by one of our very favourite authors, Ian Stewart. One we particularly like is 17 equations that changed the world. As the name suggests, it's about equations that have had a profound impact on humankind, from Pythagoras's theorem about right-angled triangles to the Black-Scholes equation about financial derivatives. It's a fascinating and accessible tour through some very interesting maths. Stewart has written plenty of popular maths books, which are all well worth looking at, but there's another one we'd like to mention: Does god play dice is a great introduction to mathematical chaos, which inspired one of us to go and do a PhD in maths — she's never looked back! How about whiling away your time on a planet that's made entirely of beaches and where it's always Saturday afternoon? If that sounds good, then you better get your hands on the Hitchhiker's guide to the galaxy, the indispensable companion of intergalactic travellers. We revisited Douglas Adam's cult trilogy in five parts when we were writing our book (Numericon) and sill loved it as much as when we read it for the first time. If you're not familiar with this classic, it starts with the Earth being demolished to make way for an intergalactic superhighway and the only two survivors hitching a ride on a passing spacecraft to embark on a journey that holds surprises way more bizarre, and menacing, than Saturday afternoon planets. If you are one of the many people who do know the Hitchhiker's guide then consider rereading it. It's fun! The travelling salesman is one of our favourite mathematical movies. 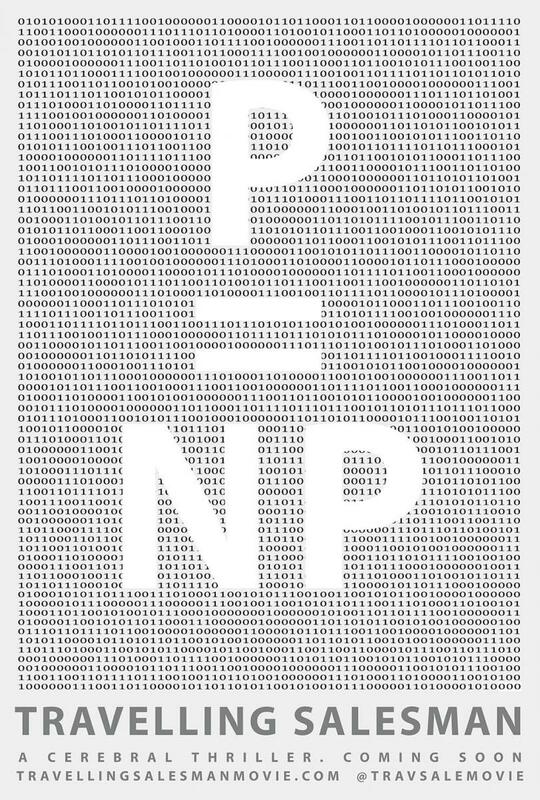 It's a tense thriller revolving around one of the most difficult open problems in maths, the P vs NP problem, and its potential to deliver the key to the world's most secret messages. Most of the movie is set in a single room, a secret government location, where four mathematicians are being debriefed as their highly classified project has been completed. An unexpected by-product of their work is a method for cracking the codes used to encrypt classified messages, giving rise to an intense debate between the mathematicians. Will their work be used for evil, by governments (or worse) to spy on all our communications and data? Would keeping it secret hamper medical advances and scientific discoveries that could be a force for good? The result is an intelligent movie full of suspense that takes maths, as well as mathematicians, seriously. Visit the movie's website for download or instant streaming. To read about other mathematically inspired movies, read Maths, madness and movies. How are you feeling about Christmas lunch with the relatives? Worried you'll regress to your teenage years and all start pushing each other's buttons? The answer to this, as to all other questions, comes from maths: it pays to be nice! For the full answer to this question, as well as a great way to while away the time between courses, get yourself or your loved ones a copy of SuperCooperators: Evolution, altruism and human behaviour or Why we need each other to succeed by Martin Nowak and Roger Highfield. We were lucky enough to travel to Cambridge, MA, to meet Nowak and his colleagues and find out more about his research. You can read our interview with him and other stories about the maths of altruism in our package and ebook. We have a Mega Menger! Thanks to the tireless effort of students, the Centre for Mathematical Sciences in Cambridge (home of Plus) now has a piece of the largest distributed fractal model in the world. It's a model of a Menger sponge made out of over 48,000 business cards that are held together without any glue or sticky tape. Sets of six cards were folded up to form little cubes, a total of 8,000 of them, which together form an approximation of the sponge. The final result, which now adorns our common room, weighs over 90kg and is 1.5 metres tall. A model of the Menger sponge at the Centre for Mathematical Sciences in Cambridge. Little cubes made out of six cards. The sponge model build was started off at an public event back in October, using thousands of little cubes that had been pre-built by students from twenty Cambridgeshire schools, coordinated by the Further Mathematics Support Programme. Enthusiastic members of the public and university students then finished it off, at one point working by the light of a single bulb when the building had shut down for the night. The effort is part of the MegaMenger project, which aims to build fractal models in multiple sites worldwide. If you would like to see our Mega Menger model, come to the Maths Faculty event at the 2015 Cambridge Science Festival, Saturday 21 March 2015, 12 noon — 4pm. You can find out more about fractals and the Menger sponge here. Students building the sponge by the light of a single bulb.